Coat of arms of the count of Burgundy (up to 1231). 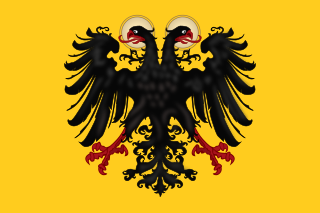 The Anscarids (Latin : Anscarii) or the House of Ivrea were a medieval Frankish dynasty of Burgundian origin which rose to prominence in Italy in the tenth century, even briefly holding the Italian throne. The main branch ruled the County of Burgundy from the eleventh to fourteenth centuries and it was one of their members who first declared himself a count palatine. The cadet Castilian branch of Ivrea ruled the Kingdom of Galicia from 1111 and the Kingdoms of Castile and León from 1126 until 1369. The House of Trastamara, which ruled in Castile, Aragon, Naples, and Navarre at various points between the late 14th and early 16th centuries, was an illegitimate cadet branch of that family. Anscar I was the margrave of Ivrea from 888 to his death. From 877 or 879, he was the count of Oscheret in Burgundy. He supported Guy III of Spoleto for the throne of France after the deposition of Charles the Fat in 887, but after Guy's failed attempt and the coronation of Odo, Count of Paris, he returned with Guy across the Alps, where the duke was elected King of Italy. In gratitude, he created the March of Ivrea in the northeast and invested his Burgundian supporter. He was a son of the count Amadeus of Oscheret of possible Bavarian origin with landholdings also in Tegernsee. Anscar was a counsellor of Boso of Provence and brother of Fulk, Archbishop of Rheims, who strongly supported the Carolingian dynasty in France. With Fulk, he probably invited Guy to France. Anscar fought on behalf of Guy's kingship in Italy. He battled Arnulf of Carinthia during the latter's invasion of 894 and he supported Guy's son Lambert after Guy's death that year. In 896, he was one of the few in the north to oppose Arnulf second invasion. After Lambert's death, he supported Berengar of Friuli as king and became his chief counsellor. Guy of Spoleto, sometimes known by the Italian version of his name, Guido, or by the German version, Wido, was the Margrave of Camerino from 880 and then Duke of Spoleto and Camerino from 883. He was crowned King of Italy in 889 and Holy Roman Emperor in 891. He died in 894 while fighting for control of the Italian Peninsula. Langres is a commune in northeastern France. It is a subprefecture of the department of Haute-Marne, in the region of Grand Est. Lothair II, often Lothair of Arles, was the King of Italy from 948 to his death. He was of the noble Frankish lineage of the Bosonids, descended from Boso the Elder. His father and predecessor was Hugh of Provence, great grandson of Lothair II, King of Lotharingia, and his mother was a German princess named Alda. Adelaide of Italy, also called Adelaide of Burgundy, was a Holy Roman Empress by marriage to Holy Roman Emperor Otto the Great; she was crowned as the Holy Roman Empress with him by Pope John XII in Rome on 2 February 962. She was regent of the Holy Roman Empire as the guardian of her grandson in 991-995. Henry II, also known as Saint Henry the Exuberant, Obl. S. B., was Holy Roman Emperor from 1014 until his death in 1024 and the last member of the Ottonian dynasty of Emperors as he had no children. The Duke of Bavaria from 995, Henry became King of Germany following the sudden death of his second cousin, Emperor Otto III in 1002, was crowned King of Italy in 1004, and was crowned by the Pope as Emperor in 1014. Autun is a commune in the Saône-et-Loire department, France. Located in the Bourgogne-Franche-Comté region, it was founded during the Principate era of the early Roman Empire by Emperor Augustus as Augustodunum to give a Roman capital to the Gallic people Aedui, who had Bibracte as their political centre. In Roman times the city may have been home to 30,000 to 100,000 people, according to different estimates. Nowadays, Autun has a population of about 15,000. Otto-William, was Count of Mâcon, Count of Nevers, and the Count of Burgundy. The greatest of the free counts was Renaud III, who, from 1127, used the title franc-compte as a sign of independence of German or Imperial authority, but was forced to submit to Conrad III. His daughter and heiress, Beatrice, married Frederick Barbarossa and united the Anscarid inheritance with that of the Hohenstaufen. Burgundy was inherited by her son Otto I, who had an Anscarid name. Thus the county was lost for the House of Ivrea, but it came back when Hugh of Chalon married to Adelaide countess of Burgundy, daughter of Beatrice II of Hohenstaufen (Otto I's daughter). However, in 1315 died Robert, Count of Burgundy, last male of the main line and the county inherited to the Dampierre family and finally to the Capetian-Valois dukes of Burgundy. John I of Chalon-Arlay, a younger brother of Hugh of Chalon, became the founder of the line of Chalon-Arlay. His descendant, John III of Chalon-Arlay married Mary de Beaux princess of Orange, thus the principality was acquired by the family. The last male offspring was Philibert of Chalon who died in 1530. The possessions inherited to his sister's, Claudia of Chalon, son, i.e. René of Nassau. Raymond, fourth son of Count William I of Burgundy, travelled to Castile-León in the late eleventh century and there married Urraca, the future monarch. She was succeeded by their son, Alfonso VII. Subsequent monarchs of Castile and León were their agnatic descendants until the 16th century, although the crown had passed to an illegitimate cadet branch, the House of Trastámara, in the late 14th century. Portuguese House of Burgundy, a cadet branch of the House of Capet, which ruled Portugal contemporaneously with the Castilian House of Ivrea. Arduin was an Italian nobleman who was Margrave of Ivrea and King of Italy (1002–1014). The March of Ivrea was a large frontier county in the northwest of the medieval Italian kingdom from the late 9th to the early 11th century. Its capital was Ivrea in present-day Piedmont, and it was held by a Burgundian family of margraves called the Anscarids. The march was the primary frontier between Italy and France and served as a defense against any interference from that state. Adalbert I was the margrave of Ivrea, the second of the Anscarid dynasty, from the late 890s until his death. In the intermittent civil war which affected Italy from 888 into the 930s, Adalbert initially strove to remain neutral, but from 901 on he sided sequentially with every claimant to the Italian throne. Willa, known as Willa of Tuscany (911/912-970), was medieval Italian noblewoman. By birth she was a member of the Bosonid noble dynasty. By marriage to Berengar II of Italy she was countess of Ivrea from 930 to 963, and queen consort of Italy from 950 to 963. The Battle of Firenzuola was fought on 29 July 923 between the forces of Rudolph II of Burgundy and Adalbert I of Ivrea on one side and Berengar I of Italy on the other. The battle was a defeat for Berengar, who was thus de facto dethroned and replaced by Rudolf as King of Italy. His own grandson and namesake, Berengar II, who would later be king of Italy as well, fought on the winning side against him. Anscar was a magnate in the Kingdom of Italy who served as Count of Pavia (c.924–29), Margrave of Ivrea (929–36) and Duke of Spoleto (936–40). He is sometimes numbered "Anscar II" to distinguish him from his grandfather, Anscar I of Ivrea. Described by Liutprand of Cremona as courageous and impulsive, he died in the battle of Spoleto. Milo was the Count of Verona from 931 until 955. He was a vassal of four successive kings of Italy from 910. Under Berengar I he became a courtier (familiaris) and by 924 head of the bodyguard. By 927 he had expanded his landholdings to have vassals of his own. Under Hugh, he revolted twice but kept his position in Verona. Under Berengar II, he was raised to the rank of margrave (marchio) in 953. Ermengarde of Tuscany was a medieval Italian noblewoman. She was the daughter of Bertha of Lotharingia and Adalbert II, Margrave of Tuscany. She was countess of Ivrea through marriage to Adalbert I of Ivrea. Alongside her half-brother Hugh of Italy Ermengarde was an important opponent of Rudolf II of Burgundy’s rule in Italy.